I woke up quite early, into a very misty Jakarta. I kind of like it. Total foggy. Dark. But calm. I sit outside for about 30 minutes just to calm myself. Today is one big day for one big meeting. I need to be prepared. I was seeking strength in my quiet moment. I never thought, not once, that I need to calm for something else entirely. Until I was on the road, that early morning. The road looks fine so I drove easily. I need only 10 minutes to get to the office. 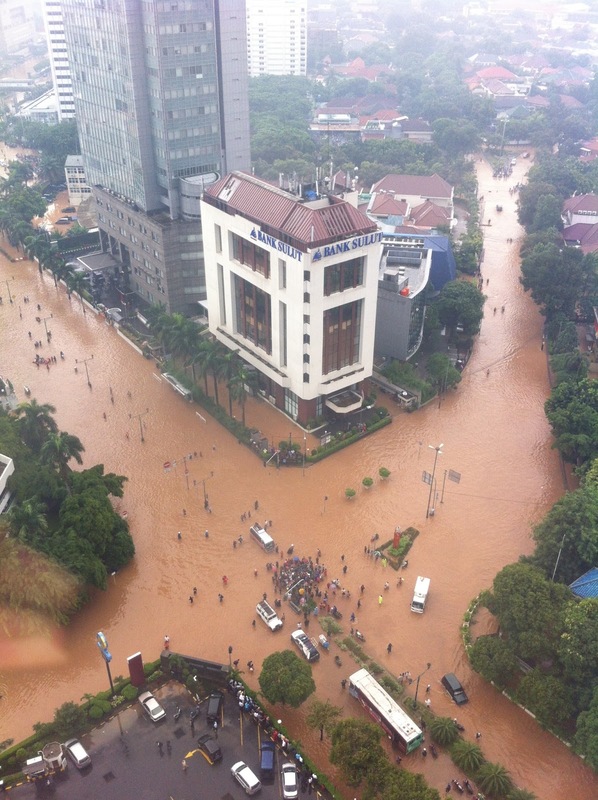 It's an extremely short distance for Jakarta measurement. 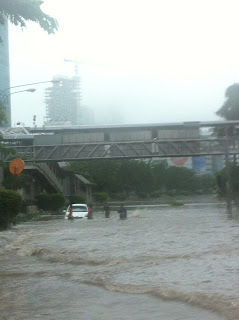 When it got a bit stuck in the middle of Jalan Kuningan, I didn't think too much about it. Traffic is what life about in Jakarta. I saw water on the road but still OK. It's only a bit of it. 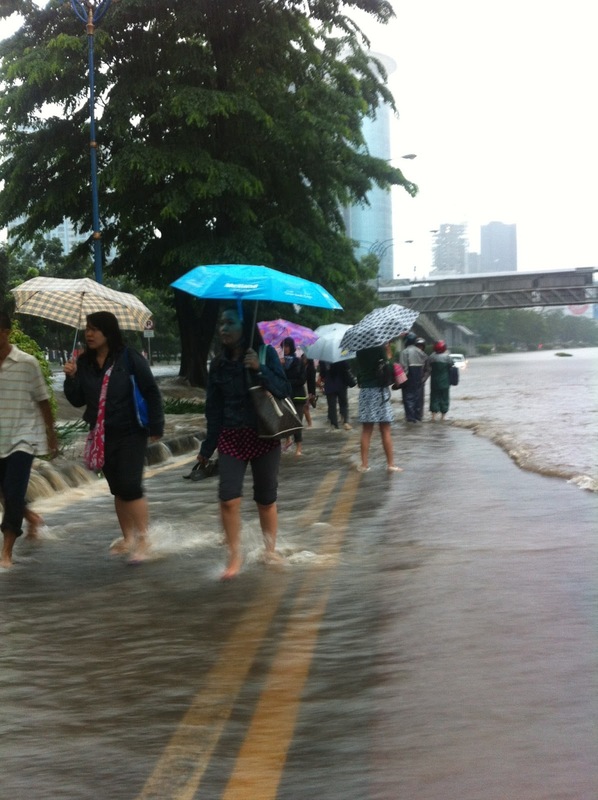 In the middle of it, like third quarter of my trip, the water got higher. Cars around me, mostly SUV type, tried to get away fast. Me, with my small car, couldn't that. At one time, I was talking to one of the team member,"I couldn't come, the train stopped". I told him it's OK, just go home and stay safe. After I said that, I realized I am in the middle of water, alone. The car in front of me stopped, can't move. I can feel water on my feet, going up quite fast. I called Astra - the car insurance - to try to get me. He told me to stop the car,"don't push it, Mba, just stop," when I told him all signs in the cars were on and red. I am a bit claustrophobic, it was a disaster. Then, two men approached me. Asked me to push the car. I rejected. The stream was going in speed. I don't want anything happened to them. "Just help me to get out from here, Pak, please," I said. They helped me open the door, told me,"don't go there, it's a deep hole". But I was too afraid to move, I am afraid of the stream. One of them said,"it's OK, let's go". So I was standing in a relatively drier area. In the middle of the road. No longer panic. Just extremely calm. I was thinking, I should decline all phone calls because I was not sure how long I'd be standing there. I have umbrella. A bit wet but it's OK. Some people came, asked to be under the umbrella to make phone call. I heard them all. One of them had a hard time to convince his supervisor that his bike was totally broke and flood was as high as the belly. I felt sorry for him. Another person cancelled a meeting. I felt like a public phone booth without the phone. They tried to make sure the phone stay dry. During that time, I talked to my baby brother who had been way too kind to come to get me. I told him not to. There is no way he could get me. The water is way to high to walk, the stream make it more dangerous. But he insisted. After 30 minutes or so, he told me he couldn't move forward. All those time, I just stand there. Balancing myself. Thinking how cold Jakarta. That is very rare. I tried to imagine myself on a beach. It felt similar. Like this Pangandaran beach with its strong current. Sans sands. I was thinking, I had lived in an area prone to flood but I never experience once. I am currently living on 24th floor and there I was getting caught in the middle of water. Astra called to inform me that no vehicle can get me at that moment. I understand completely. A guy came with walkie talkie and bunch of kids. One big guy and those children came to the car and took it to drier area. I never thought it could be done. They did it after the walkie-talkie guy make sure I got all important things with me, nothing valuable in the car. The walkie-talkie guy apparently one of civil servant from Park Government Office of Jakarta. He checked things. He only left after he make sure I am safe. It was so different with bunch of people came earlier near me. They got off from their vehicle, pushed me around, to take picture of the car. My car that got stuck in the middle of the water. Apparently, helped came from stranger. But again, they are no stranger, they are people with kind heart, with calm mind, with eagerness to help. Even if they actually can stay dry somewhere else. I am now at the office. The car miraculously well function, despite all the water in it. My baby brother pushed me to turn on the engine. I drove with such slow speed, not once change the gear. The dress has been dried. In fact, I had changed clothes because they were so stink. but I know, there are many who still get caught in the flood. Some already living under the tent. I can see Governor of Jakarta, near my building, did his inspection. Stay safe, everyone. Help others - whenever possible. And, if I may suggest, not joking around about it. oh, the meeting is postponed btw.